The rector and principal of Darululoom Zahedan, the biggest Islamic seminary in Iran, talked to dozens of rectors and teachers of Islamic seminary, imams of mosques and Khateebs at the Grand Makki mosque on 26th July, 2017. Our duty is not only to teach some books and then move to home. Make plans for the edification of students; only teaching is not enough. Attract people of all classes and guide them. Cooperate with the activists of Tablighi Jamaa’t and support them. Support whoever serves Islam and benefit from their experiences. Friday imams and preachers should meditate on their words. Consider the needs of people. Our stances should be with sympathy and taking care of temperance. Criticism should be constructive and tolerable; speak rationally. Teachers should not depend on book explanations (shurouh). Studying is good to find solutions, but meditate on the lessons more. Before delivering speech, think a bit that our speech should be for the sake of Almighty. Rectors of seminaries should be present in the seminary. Sitting in the office is not enough; rather they should check different parts and offices. Cooperate with people and authorities. Participate in the happiness and sadness of people. Convey their voice to the authorities. Do not make revocation of magic and writing Ta’wiz your job; it makes you worried. Most of the clients are women. Avoid discord and differences. Manage differences wisely. Do not allow differences to take root in your region. Do not make mosques and seminaries ‘shops’. Do not declare others’ mosques “Dhirar”! 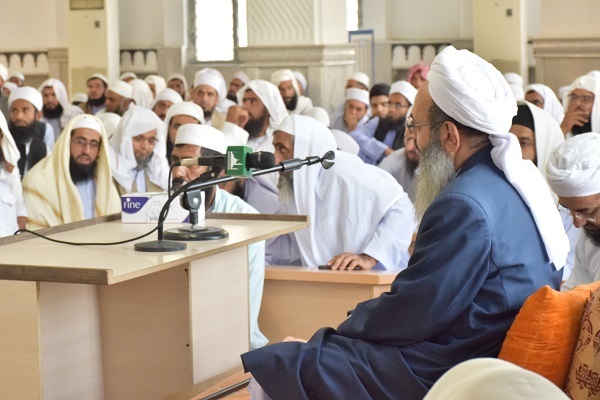 There should not be rivalry among seminaries. Respect old Ulama. They are like father; they have worked hard, however they suffer from lack of literacy. Today is the era of communication. We should prepare ourselves and talk in the modern language. Speeches should be in an up-to-date language. Remain in contact with collegians and school teachers. Do not be away from them.